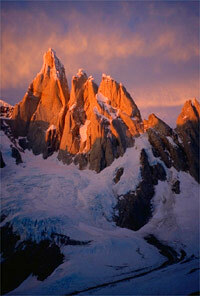 OBJECTIVE: First free ascent of Fitzroy's West face. 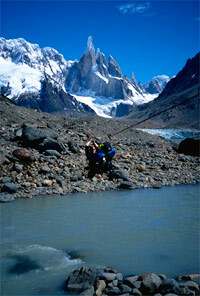 Patagonia is the tempestuous region at the Southern end of the Andean mountain range. Encompassing two countries the area is famous for fast winds, shipwrecks, condors and monolithic granite. The equivalent northern latitude in America is just North of the Canadian border, Calgary/Rockies, in Europe it equates roughly to Manchester in Northern England. My partner for this mission Alan Mullin is the current point man in Scottish mixed climbing. In the southern Chilean town of Puerto Natales he laughed at travelling so far to find the same ecology & scenery just left behind in Scotland. Grass & weeds sprout vigorously through the sidewalk cracks, flat-bottomed clouds always pepper the sky on an invisible plane of glass; the souvenirs T-shirts even sport images of sheep. Here in the foothills of Paine the rolling landscape patch-worked with snow mimicked spring in Wales, the Lake District or Scotland. All regions familiar to my youth in the UK, but on prior visitation here to Patagonia, I’d missed the similarity having travelled from the arid California climate. Together we were en route to Fitzroy’s 2600m West face with ideas on ascending it Alpine style & hopefully free. Puerto Natales was our first stop; having flown into Punta Arenas, which now lies four hours drive south east, on the northern bank of Magellan’s Strait. Chilean friends took us to the newly opened discothèque "El Templo": I’m proud to say we introduced the DJs to techno, trance & house, they excitedly burned copies from my travel collection and introduced them into their sets. Six weeks later on our return journey home the CDs were still getting lots o’ use. Over the border into Argentina to the ritzy tourist town of Calafate, one step closer to Los Glacieres National Park & the Fitzroy/Cerro Torre massifs. Most of our six weeks food needs were acquired in Chile; economies differ greatly in S. America groceries are three times the price in Argentina & they will not exchange any Chilean currency. US dollars are standard and the Argentine peso is rigidly tied to them. Tourist dollars have bolstered all in the chain of towns we travelled through. My friends in Natales showed visible signs of revenue, nicer or first cars, bigger TVs, cell phones & electronic trinkets… all were much busier. El Chalten at the end of our road boasted double the amenities from two years prior, added markets, restaurants, shops & guides, yet it still held frontier allure. The streets are yet to be paved and there are no big hotels or facilities. January's standard fierceness was as normal; the boiling White Wall sat over the peaks rendering postcard images more real than many visitors’ visions. Rare glimpses of the proud granite stalagmites serve only to tease the summer vacationers. Our destination: Campamento "Bridwell" sits snugly by the fine mineral rich drinkable waters of Rio Torre, below the lake & glacier it spawns from. An idyllic setting sheltered from wind by a bank of moraine, and seeming just beyond storms stretching arms. The location narrowly avoids the steady pelt of rain, and boulders litter the moraine-encircled valley; fun & fitness while peaks remain shrouded. Camp Bridwell is a little over two laden hours from town (one non-load bearing hour); we employed horses to hump our major load up to camp. Once in the area weather becomes prime focus, pressure readings, wind direction checks, one has to be ready for any burble in weather. Hence the horses for the sake of speed in getting established. After hurriedly setting up we waited days before being allowed passage up glacier to deposit equipment (climbing gear, food, bivi set-up & ropes) at Polish Bivi, five laden hours up valley. A small boulder sheltered trough/valley above the moraine of the valley’s third glacier. The first glacier is circuitous to negotiate; traverse one way avoiding crevasses then back the other avoiding drainage chasms. The second crossing is over debris covered ice, no large fissures to dodge if travelled on the correct side, its western flank is a whole different realm of doom. Approaching the Tres Torres and Fitzroy only requires the final glaciers terminal moraine to be traversed, beyond it branch left for Norwegian bivi’s boulder caves & the Torres; or branch right for Polish bivi’s scant shelter & all the West faces of the Eastern peaks. 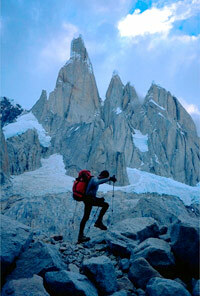 Cerro Torre, Torre Egger & Cerro Standhardt dominate the Western side of the Torres valley. The longer Eastern massif/ridge begins (south) with Mojon Rojo, then Aguja de l’S, St Exupery, Innominata & Poincenot, followed by Desmochada, Aguja d’ Silla and Fitzroy. Beyond Fitz’s protruding "Sitting Man Ridge" lies the glacial Dome Blanco sealing the cirque. Mark Synnott & I had stepped in the ring with Cerro Torre’s Compressor and Standhardt via a new direct start, two years prior. We also had a brief bout with Fitzroy’s 2600m West Face. A day & a half of climbing followed by the "Patagonia experience" descent, howling wind and rime ice. Alan & I now began the West Face of Fitzroy from Polish camp: Roughly 45 minutes from the couloir gaining access to our climb. A prior lull in weather allowed gear & food to be stashed on the first rock buttress 280m into the couloir. No fixed lines were employed, just a cache left at the beginning of the technical climbing. With the advent of good weather we moved together, simul-climbing the initial mixed ground to the prominent feature "Sitting man ridge": Mainly easy mixed with two short 85° sections. Continuing along the ridge in simul-style (easy rock, 5.7) until the face proper, a long somewhat drawn out & occasionally technical approach. Reminiscent of some of the not-so good Californian Sierra routes. The true face begins with three chossy 5.9 pitches in turn depositing one below a big overhanging grey dihedral. Here was the only snow melting possibility en route & flat ledge providing perfect bivi opportunity. Probably 11 hours climbing time to reach this point, not too far into the journey (30%), but we stopped, drank & ate while turning snow into seven much needed litres of water for the remaining mission. Mark & I also bivied on the exact same "Déjà vu" ledge. Snow conditions were fatter on the first (’98) foray, melting wasn’t necessary; the snow patch readily spouted streams actuated by the sun on its day’s end soak of the face. Sleeping bags had been luxurious for Mark & I; one we now didn’t have. The lighter & hopefully much faster approach Alan & I now took didn’t make for the same warm cosy night’s sleep. Alan had a bivi sack I slept in my pack, a custom built X frame with collar extending to bivi bag length. Draped over both was a lightweight rip-stop nylon cover. The next day's breakfast pitches through the overhanging dihedral proved to be the technical crux, hard 5.11. Two bouldery sections a steep face traverse and an awkward crack was the meat, both in the first pitch above the ledge. Two more stretched ropes above deposit you on broken ledges: From this point the only established route on the face, the Czech route branches right. Our initial plan was new climbing directly above the ledges up & into a large dihedral splitting the left side of the face. A pitch offered the vision of many more sustained off-widths & began to thwart psyche. Free climbing the remainder of the Czech route became the goal. The climbing stayed mainly in the 5.10 range with occasional 5.11 pitches & steep tricky sections: Steep ramps, cracks & chimney/off-widths characterized the route. Fine weather enjoyed the prior day slowly deteriorated. Bright moonlight had been counted on to aid plans to climb through the night. The moon never broke the cloud’s veil adding a nagging worry. Wind became our plague in the early morning hours. Junction with the California route just after sunrise brought some respite, hiding around the Southwest arête changed condition dramatically everything was verglassed, yet the wind howled wildly around the arête but not on this facet of the peak. Our climbing continued above the junctions of Ensueno, Supercanaleta & the ’68 California route. Opting to stay on the South side in a continuous dihedral (CA routes descent), instead of weathering the North side & the brunt of the weathers offering; conditions continued to deteriorate. After 25 hours climbing beyond the bivi the second tower became our highpoint, above the Czech route’s climbing conclusion & reached without resorting to aid. 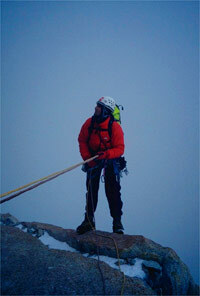 Strong wind & rime ice prevented us from traversing the final 250m across the North side to the summit. The climb required around thirty pitches plus a substantial amount of simul-climbing & short fixing. Descent was made down the California route. With continued descent down the West Side via a somewhat epic course beneath Desmochada & finally back down to Polish bivi. One night of rest in Polish bivi and we stumbled down valley intent on a quick visit to basecamp with further trekking for fattening meals in Chalten. Ending up falling asleep on the carved wooden benches of the camp’s ramshackle hut comfortably bloated by rice & the sweet local indulgence of Dulce de Leche. The same hut that hosted a discotheque (travel speakers & CD Discman) several nights prior: It was a couple of nights before the good weather, & unluckily for them the departure of several climbing teams; perhaps we appeased the rain gods that night? Once again fellow Bridwell dwellers loaded for departure, Tim O’Neill & Nathan Martin bailed happy with summits and more than a week late for their flight. The weather turned for the best just before departure date, they chose to brave the whimsical South American airlines. Peter Janschek, Heinz & Elmar the Austrian contingent, were also leaving all had been fun bouldering compadres & hut mates. The huts need mention; they are the focal point of the two main climbing basecamps in the region, the hub of camp’s social scene. Tents are erected for sleeping but cooking and hangin’ goes down in the hut. Climbers occupy the huts. Trekkers journey through at most spending a couple of nights, not long enough to get used to the mice & squalor. It now seemed very quiet with only Alan & I rattling ‘round camp, the weather allowed one more foray up-valley but unfortunately no more routes: Just a fine look at the next project.